Download to an iPad, Smart Board or Computer and Play 6 Fun Engaging Language Activities. Great for telepractice. 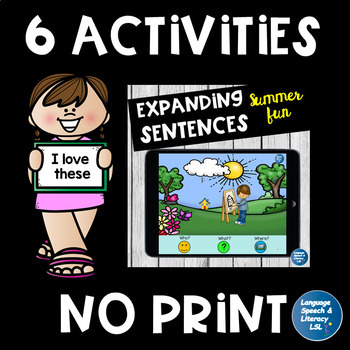 All of these activities are included in the NO PRINT - 18 FUN LANGUAGE ACTIVITIES BUNDLE. Go to the PREVIEW and Click on the ACTIVITIES check out detailed information about the products and see what SLP’s and teachers are saying about them! This bundle is designed for preK - 2. These activities will give you hours of engaging activities for engaging students in learning vocabulary, describing words, pronouns, verbs, simple sentences, Wh questions, and storytelling. These photo scenes could also be used for a variety of purposes such as asking and answering questions, conversation starters for students working on carry over of skills in articulation and fluency, sentence formulation and expansion, eliciting a language sample, etc. You will receve these products in a zip file. Check out these easy tips for accessing zip files. For more fun, engaging, NO PRINT Language Activities for iPad, tablet, computer, and/or smartboard, click on the link below. Don't miss out on flash sales, freebies, and more.